For many organizations, the journey of turning customers into loyal customers might seem easy, but it’s not. Turning customers into loyal customers is not about them looking at your product, purchasing it, using it, and then repeat the process. In reality, the journey of turning customers into a loyal customer is more likes sightseeing tour that includes stops, exploration, and discussion before you convince them. It becomes now easier to convince them to choose your brand and stick to using the products instead of switching to other brands. Here is a look at the steps you can take to start your journey mapping. Before your journey mapping, first, you need to clarify your business goals. All marketing activities and communication you perform during this period should focus on reaching your brand's goals. However, you should never forget to know and acknowledge your customer’s goals. You need to understand that your goals and theirs will always be different. For instance, if your goal is selling sunglasses with improved lenses, your customers' concern might not be lenses, but a style that matches their lifestyle. So, before starting your journey mapping, consider clarifying your goals, understand your customer goals, acknowledge they are different, then find common ground and alight your goals and your customer goals. The marketing strategy and communication strategy you choose should focus on helping you and your customers reach your goals. When do you engage with your customers? There are things you need to focus on. To start with, make a list of interaction moments before grouping them based on what will happen and when will they happen during the journey. List the pre-purchase, actual purchase and post-purchase. Start by finding communication touchpoints you missed. Track and trace the actions and interaction with your customers before and after purchase. A good example is noticing the communication touchpoints before customers purchase products. These touchpoints might be things like confirming customers interesting in an item, those who purchase and then suggested related products. Noticing these touchpoints will help your team, provide details about each micro-interaction. Recognizing what your customer is feeling during pre-purchase, actual purchase and post-purchase gives you the opportunity to help them reach their goal. For instance, your customers could be happy while browsing your website, but they become confused or frustrated when it comes to purchasing a product. These are pain points you should recognize in your journey mapping. Also, other things you need to focus on include your web design, your copywriters, marketing team, and situation that make then either delighted from using the website or those that frustrate them. If your customers like your online ads, the presentation in your store and by the salespeople should be the same. This means your salespersons should better align their sales pitches and language. If possible, put yourself in your customers’ shoes, take the journey your customers take yourself to get the feeling your customers get and experience the journey yourself. For example, if your business is online, open the browser and experience what your customers experience. The same goes for those with brick-and-mortar stores. Visit your store, then find issues about the communication touchpoints you encountered before finding the solution. Another thing you should remember in this category is your competition. Become their customer and experience the journey their customers experience. Then go ahead and compare them with yours. Ask questions: What works well? What was missing? What difference did they do to help you complete your journey? Don’t only write down the things you experience during your journey as a customer and the communication touchpoints, but also create a visual map. Simply write the touchpoints on individual papers and sticky notes. Doing this will help you have a clear view of the entire customer journey, and you will recognize the areas for improvements. Also, consider having new ideas for adding or changing your communication touchpoints to make them more streamlined and easy. Create new communication touchpoints to improve your customer journey, before implementing and testing them. New technologies are becoming available on a daily basis, use them to make your brand better and keep evolving. Staying on top of your competition is not something that happens in a day. The same goes for journey mapping. 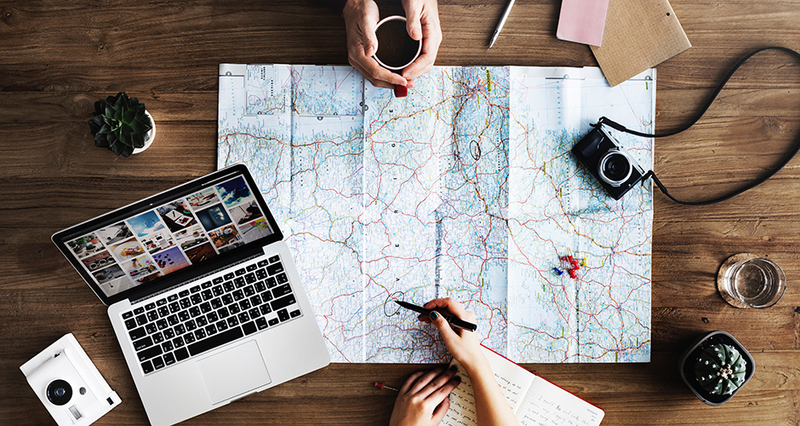 Though the journey mapping process might be challenging and needs your close attention, it will help your brand and your customers to be better integrated and ultimately increasing the loyalty of our customers. The above exercise allows you to better interact and engage with your customer. It also helps you illustrate your product and service, how they fit into your customers’ lives, goals, aspirations, and schedules. It is not a bad idea to do the journey remapping at least once a year. Evaluate the communication touchpoints and see what you can do to add more value to your customers.